Paprika, Ancho and Chipotle Chili Powder, brown and granulated sugar, garlic and onion powder and cumin give meats, poultry and vegetables a subtle, but really yummy flavor! 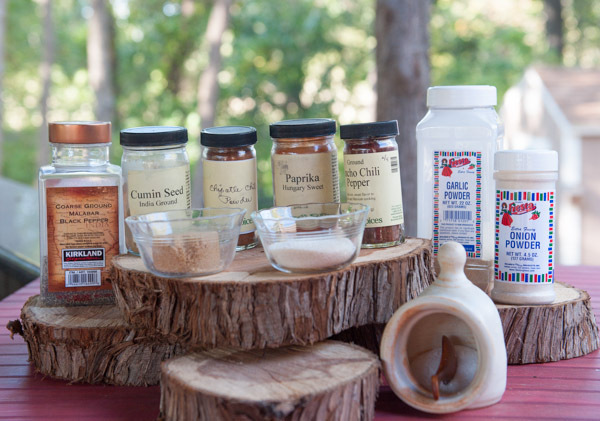 A very versatile rub. Paprika, ancho and chipotle chili powders, brown and granulated sugar, cumin and onion and garlic powder enhance the flavor of grilled meats, poultry and vegetables. A staple in my pantry! It is also great to give as a hostess gift. 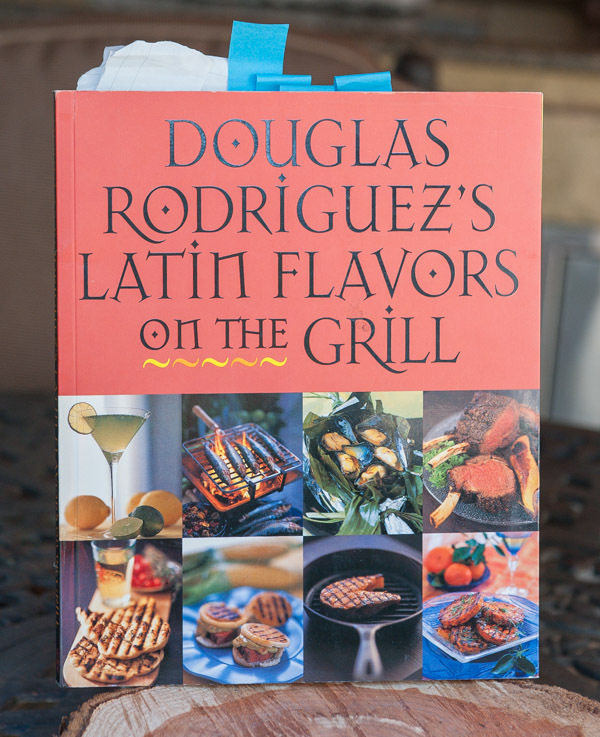 This is another recipe from the “Douglas Rodriguez’s Latin Flavor on the Grill” cookbook I recently added to my ever-growing cookbook collection. This is the second recipe I’ve worked with from that cookbook, and they’ve both been really good. The other recipe I love is Black Beans with Chorizo and Rum. 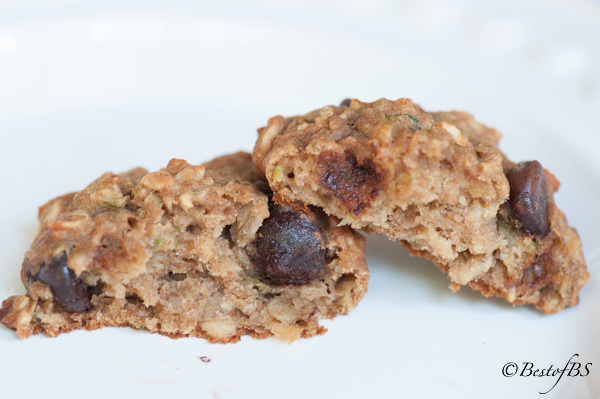 Most of the recipes are a little “different”, as they have a Latin flavor twist, but then, that’s my kind of recipe to try! (So…I’m a little “different” than your “main-stream” cook.) The more unusual sounding, the better, as it is always a surprise to see what tastes you end up with. The strange sounding recipes sometime become my favorite ones. A new cookbook find. Very unusual, but great tasting foods. I first used this recipe as a rub for a Smoked Bone-In Rib Eye Roast, which I must say, “Was the best“! We smoked it on our electric smoker, and it had just the right amount of smokey flavor with a bit of heat. (Rave reviews on that one!) I’ve repeated it on several occasions with success each time. If you don’t have an electric smoker, and you like to cook outdoors, you should consider getting one. You can also smoke on your grill by putting the smoking chips in a smoker box on the grill and cooking over indirect heat. We have a Cookshack brand electric smoker that we’ve had about 13 years, and we love it! We use it often and it has held up great. 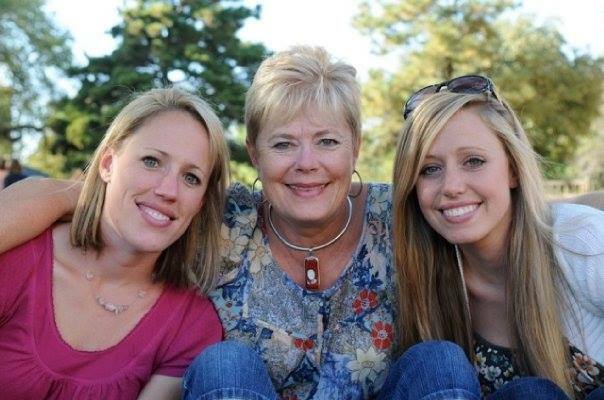 It went down a few years ago, and my son, Zach, ordered a part, put the new part in and we were back in business! Using it is so easy. First, I prepare and season the meat. Then, I put the meat in a throw-away aluminum pan to cut down on smoker clean up. Next, put the pan with the meat in it in the smoker. Last, put the wood pieces in the wood box, and turn the smoker on. Walla, a few to a lot of hours later, you have an awesome piece of meat! Think about it!!! How easy is that…cooking while you are not actually cooking! Now, back to the rub recipe. Since it makes so much, I am trying to create other recipes for it. 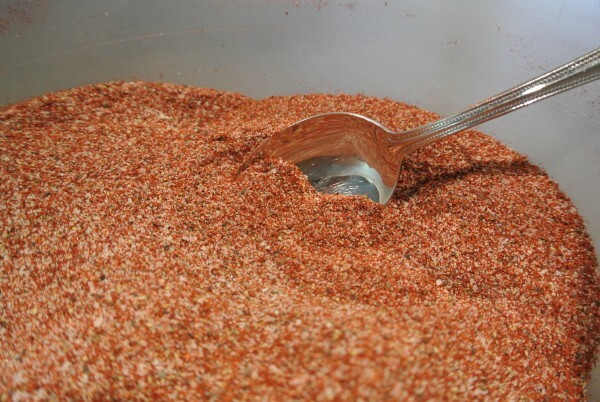 The recipe says it is a great rub for chicken, fish or beef. It also says it’s great as a sprinkle on potato chips. Trust me…as I’m a chip Freak, I’ll be trying that! This rub is now a staple in my pantry. It just sits there waiting to be rubbed on something. 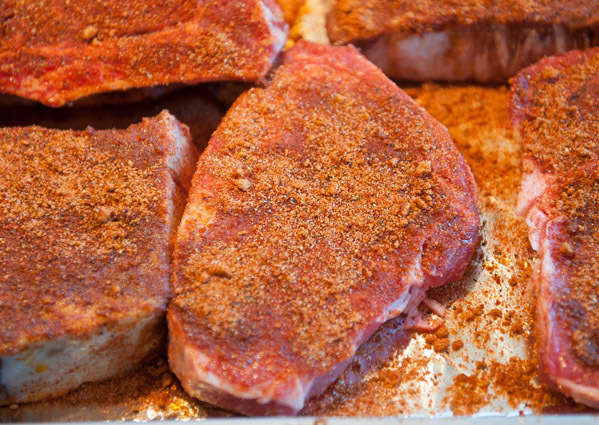 This is the Barbecue Spice Rub on Rib Eye steaks. This is the perfect amount of rub to use. First, sprinkle the rub on, then sort of rub/pat it into the meat. Let the steaks rest and come to room temperature before putting them on a preheated grill. Most of our family likes their steaks rare to medium; so we, no not we but Zach usually sears them on our searing pod. Zach and I are true carnivores! We like our steaks seared on the outside and pretty much raw in the middle. Yum…or…Yuck if you like your steaks well done! 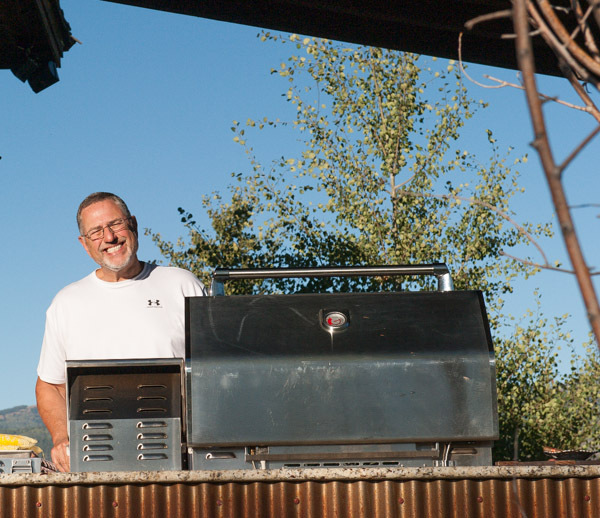 Joel was in charge of the grilling…doesn’t he look happy!! I think it must be the scenery…breathtaking!! In September, Joel and I, his brother, Stuart, and his wife, Patti, and his mom went on our yearly trip to visit his brother, Neal, and his wife, Cherie, at their summer home in Victor, Idaho. I was in charge of making dinner one night, and those rib eye steaks were on the menu. I added my Aegean Salad, Roasted Cauliflower and Salt Lick Peach Cobbler with Vanilla Ice Cream to the menu. As I have said before, “The Small Family does know how to eat” so most of the food was gone! I will post the other recipes soon. Tonight, I used it as a rub for a Grilled Rib Eye Steaks. 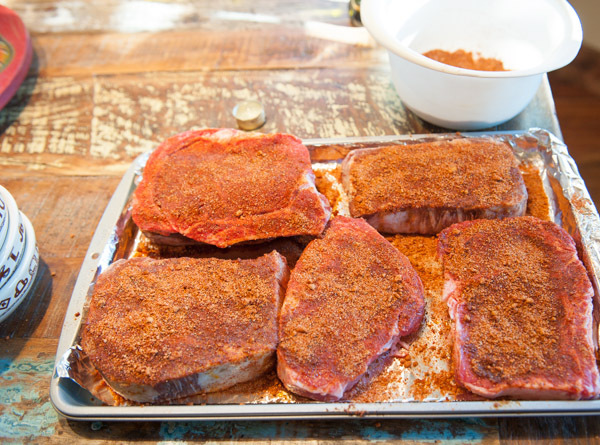 It was great!…so….here’s the rub recipe! These are the ingredients and the brands I use for this recipe. Where is a steak to rub!! 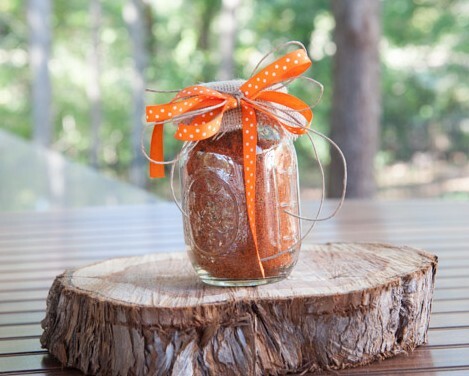 This rub stores well in a tightly covered container in your pantry. It will keep about 6 months. In a medium sized mixing bowl, using a wire whisk, thoroughly blend all of the ingredients. You could also put all of the ingredients in a large jar with a tight fitting lid and shake until thoroughly blended. Store in a jar with a tight fitting, shaker lid, making it easier to season meats...shake it with one hand and pat or rub it in with the other. This makes about 3-1/2 cups.